I prefer my wedding cakes to have a lot of icing. After all, is a cake really a cake without icing? But sometimes I find a “naked” wedding cake (sans icing) that really intrigues me. Take for example today’s nearly naked caked that is adorned with some colorful and whimsical sprinkles. This springtime cake is quite cute and would be perfect for a smaller reception or maybe a reception where there is a dessert bar plus cake. 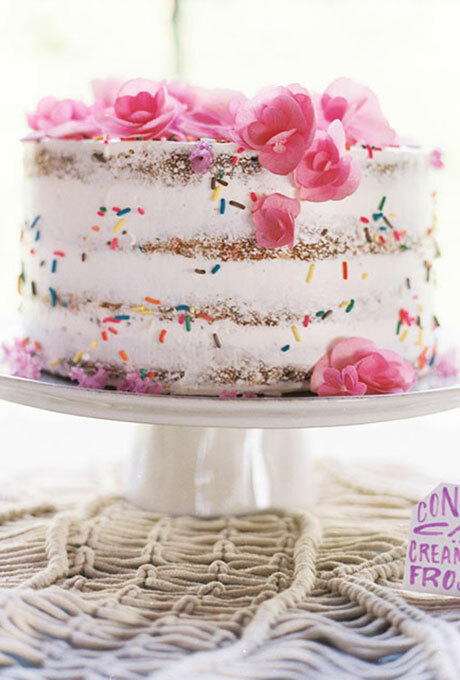 The cake features a minimal amount of white icing and a minimal amount of sprinkles giving it the perfect “naked cake look” without being boring. The addition of some pretty pink blooms on top seals the deal. You can find this cake here. It was created by Cakewalk Bake Shop.